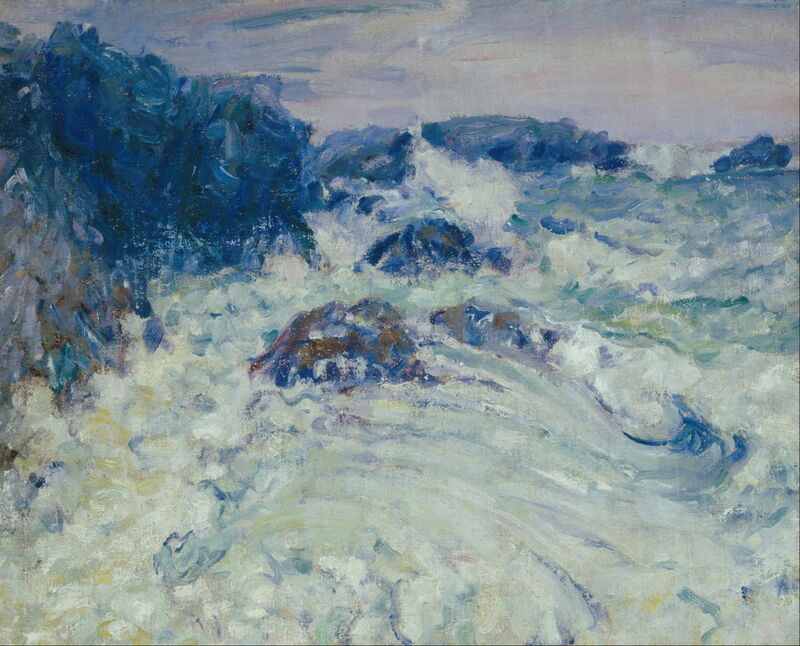 John Peter Russell (1858–1930), Rough Sea, Morestil (c 1900), oil on canvas on hardboard, 66 x 81.8 cm, The Art Gallery of New South Wales, Sydney, Australia. Wikimedia Commons. Exhibition: Australia’s Impressionists, in The Sunley Room of The National Gallery, London, from 7 December 2016 to 26 March 2017. Further details are here. The paintings shown here are among those included in both the book and the exhibition. Unless you have read my article about Australia’s Impressionist painters, the title of this book and exhibition may come as a surprise. They are important landmarks for Australian art, which may start getting the international recognition which it deserves, and for London’s National Gallery, which is on a course to be more representative of art worldwide, rather than just that of Europe. 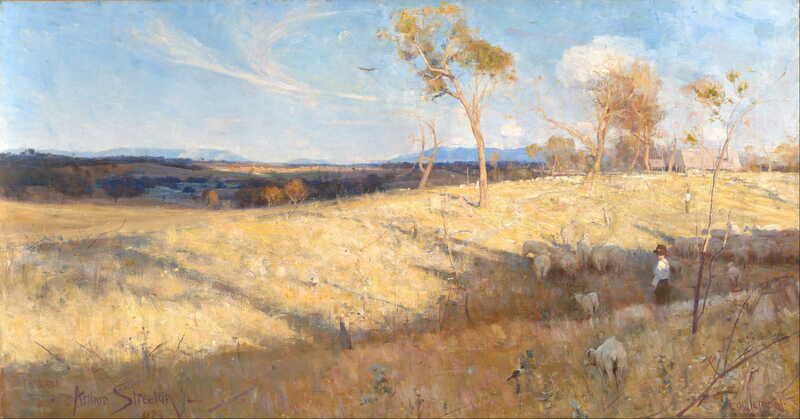 The book (and accompanying exhibition) tells the story of four Australian artists – Tom Roberts, Arthur Streeton, Charles Conder, and John Russell – who drew on the blossoming European Impressionist movement to paint en plein air in oils, using rich colours, and leaving visible brushstrokes and other marks. 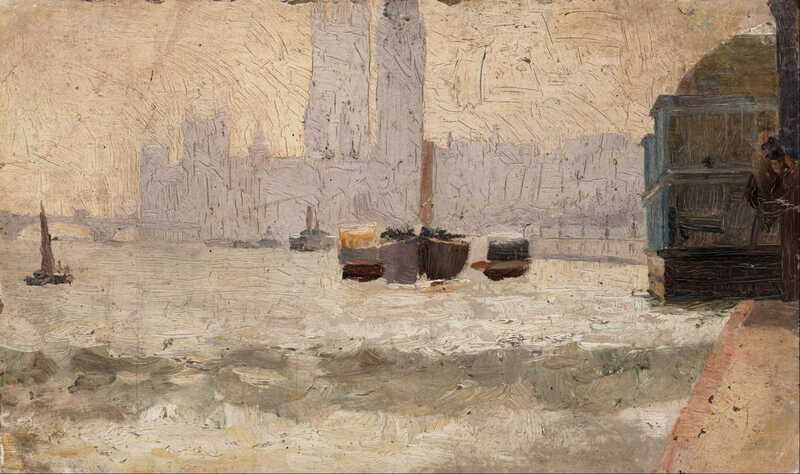 Roberts trained in London, more briefly in Paris, was influenced by Whistler, and returned to Melbourne in early 1885. 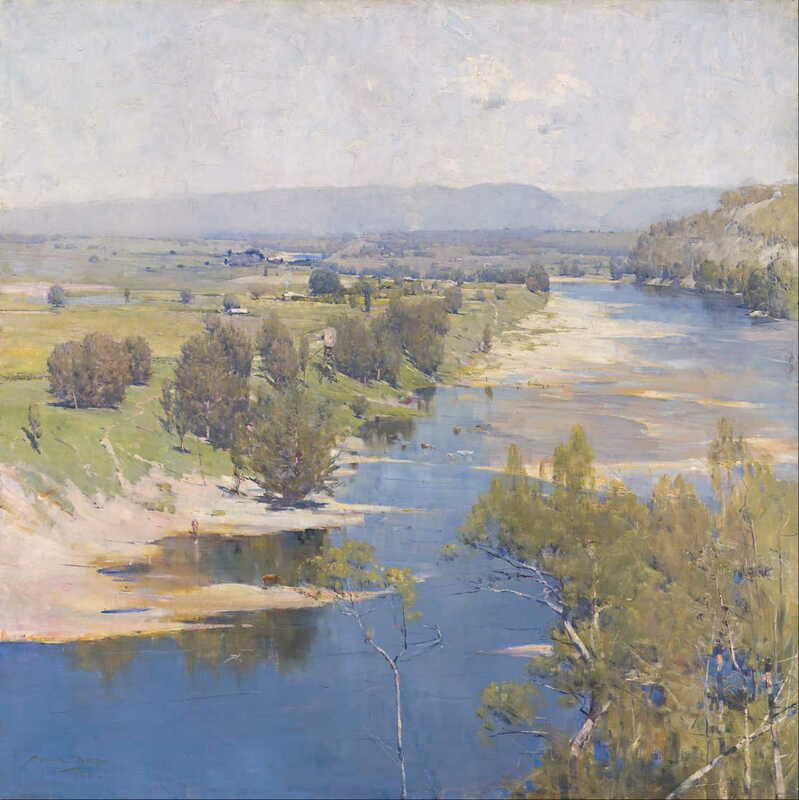 Streeton and Conder then met with him, the three became friends, and painted together, Roberts being the catalyst for their developing styles and techniques. It was not until 1890 that Conder went to Europe, and 1897 that Streeton arrived in London. 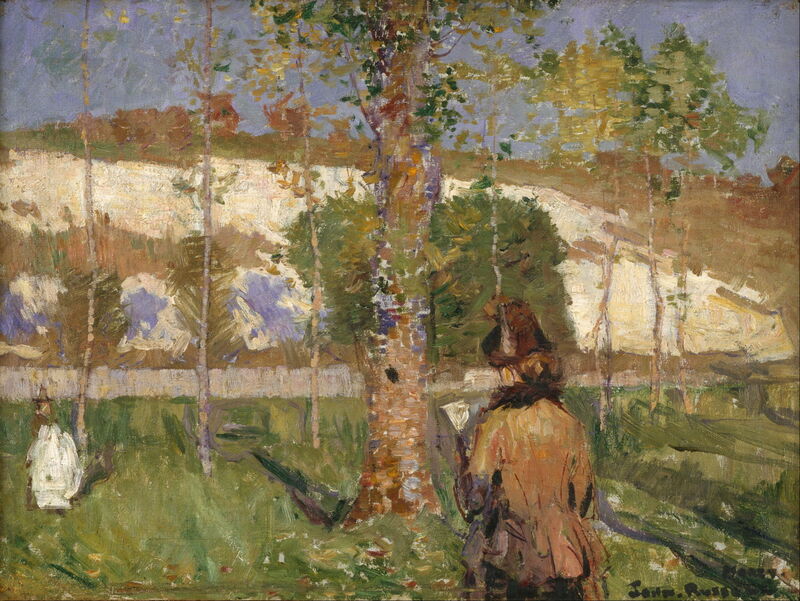 John Peter Russell (1858–1930), Madame Sisley on the Banks of the Loing at Moret (1887), oil on canvas, 45.7 x 60.9 cm, The Art Gallery of New South Wales, Sydney, Australia. Wikimedia Commons. 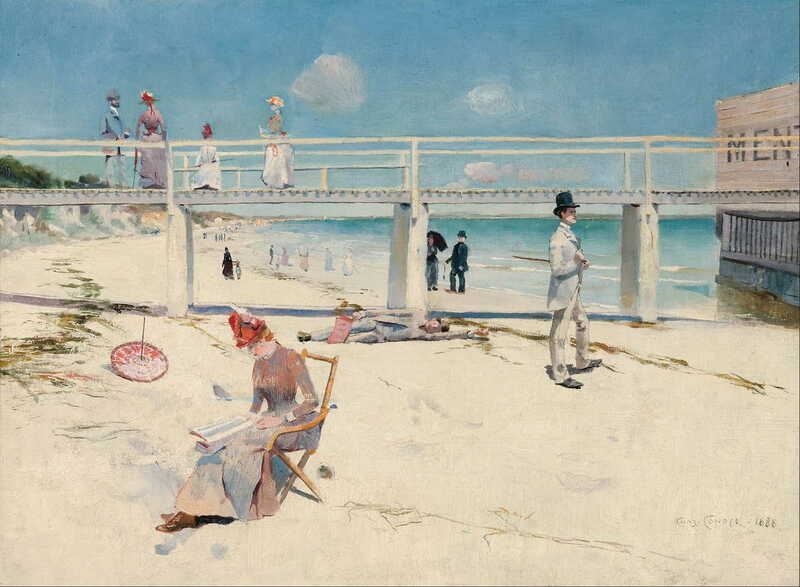 Charles Conder (1868-1909), A Holiday at Mentone (1888), oil on canvas, 46.2 x 60.8 cm, Art Gallery of South Australia, Adelaide, Australia. Wikimedia Commons. Riopelle’s opening chapter introduces the artists, and establishes Impressionism as a worldwide phenomenon, before explaining the National Gallery’s expanded mission to collect, display, and study paintings that “broadly speaking, fall within the European representational tradition but which may have been created anywhere in the world.” He promises us that “in the future, visitors to Trafalgar Square will see an increasingly diverse display of international modern art.” This is excellent news, and a great future. The second essay, by Tim Bonyhandy, gives an overview of the painters and their paintings, in the context of the ‘Sunny South’ of Australia, and the ‘glare’ aesthetic which is behind much of their work. He also examines the various names by which the group has been known, such as the Heidelberg School, and Russell’s place. Arthur Streeton (1867-1943), Golden Summer, Eaglemont (1889), oil on canvas, 81.3 x 152.6 cm, National Gallery of Australia, Canberra, Australia. Wikimedia Commons. Charles Conder (1868-1909), Dandenongs from Heidelberg (c 1889), oil on wood panel, 11.5 x 23.5 cm, Art Gallery of South Australia, Adelaide, Australia. Wikimedia Commons. 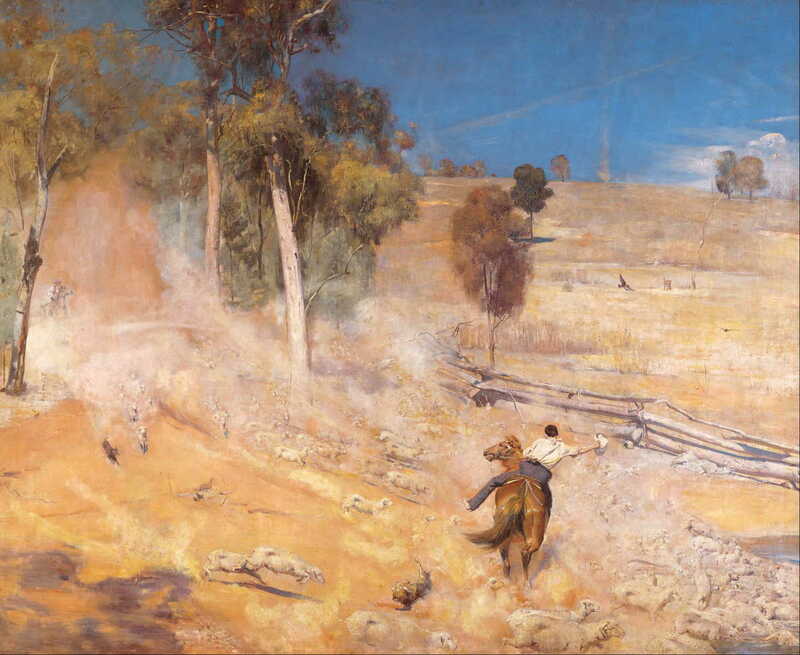 The focal event which brought the paintings of Roberts, Streeton, and Conder together was The 9 to 5 Impression Exhibition, held in Melbourne in 1889, and is the subject of Allison Goudie’s essay. This is illustrated not only by some of the paintings, but by contemporary engravings and a photo. This is followed by Sarah Thomas’s examination of one of the themes of the exhibition, the role of the Australian Impressionists in creating the Australian national identity. 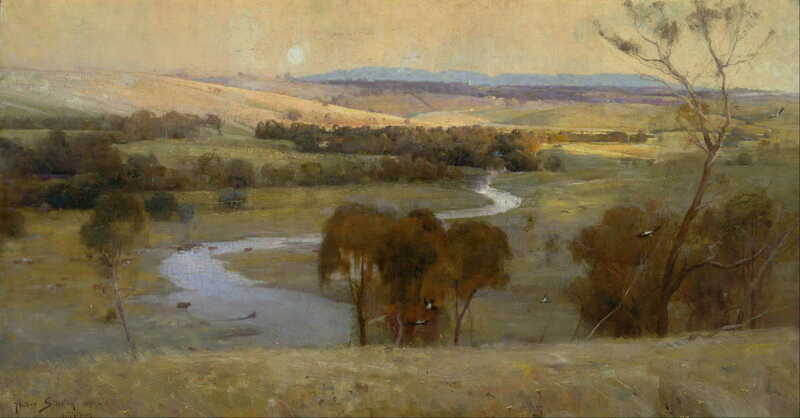 Roberts had a particular part in this, and was once known as the ‘father’ of Australian landscape painting. Arthur Streeton (1867-1943), ‘Still Glides the Stream, and Shall for Ever Glide’ (1890), oil on canvas, 82.6 x 153 cm, Art Gallery of New South Wales, Sydney, Australia. Wikimedia Commons. Tom Roberts (1856-1931), A Break Away! (1891), oil on canvas, 137.3 x 167.8 cm, Art Gallery of South Australia, Adelaide, Australia. Wikimedia Commons. Arthur Streeton (1867-1943), ‘The Purple Noon’s Transparent Might’ (1896), oil on canvas, 123 x 123 cm, National Gallery of Victoria, Melbourne, Australia. Wikimedia Commons. 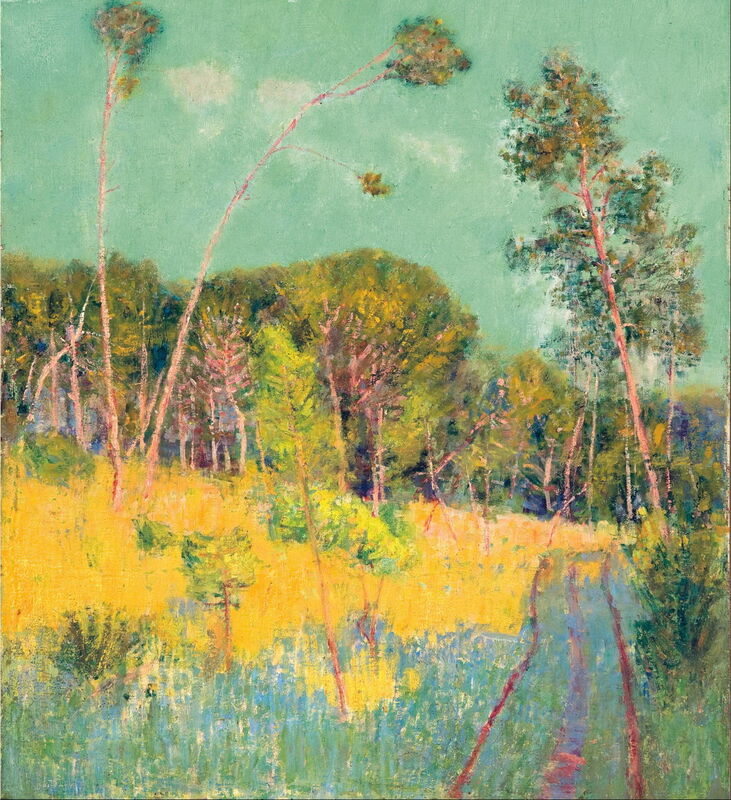 John Peter Russell (1858–1930), A Clearing in the Forest (1891), oil on canvas, 61 x 55.9 cm, The Art Gallery of South Australia, Adelaide, Australia. Wikimedia Commons. Although these essays are all excellent and well worth reading, I found the last, Wayne Tunnicliffe’s account of John Russell’s career and art, the most valuable, as there is so little available about him. For anyone interested in the history and art of the French Impressionists, this is compelling reading, and could justify the modest price of this book on its own. Russell had private means, an inheritance which had funded his study in Europe in the first place, and in 1888 moved himself and his family from Paris to Belle-Île-en-Mer, off the coast of Brittany, France, at the top end of the Bay of Biscay. It was here that Russell had first met Monet, who admitted that he preferred some of Russell’s paintings of the island to his own. Over the next twenty years or so, Russell turned his house into something of an artists’ colony, where he created some of the most dramatic paintings of the French coast, and taught the young Matisse about colour theory. I can see that I will be re-reading Tunnicliffe’s masterly essay on many occasions. The catalogue of forty-one paintings by the four artists is well-presented, and the choice of works appears balanced and representative. Although a few favourites did not make the long trip from their Australian galleries, you should find the selection a real delight. Notes on the paintings are provided in a separate section after the illustrations, and are invaluable. End matter includes very useful brief notes, an excellent bibliography, a list of works, and a very usable index. I hope that this outstanding book and exhibition mark the watershed that Christopher Riopelle promises, not only for the National Gallery’s broader remit, but of more international approaches to movements such as Impressionism. The Australian Impressionists were fine artists who made many paintings which deserve to be seen side-by-side with the best of European works of the time, and John Russell needs to be written back into the history of Impressionism in France. This book goes a long way to achieving those goals, and is a unique introduction to the wonderful works of these artists. If you have any interest in Impressionism, you will want the book, and to see the paintings for yourself. They have particular significance in these dark days of growing xenophobia, in showing how art and culture know no boundaries, and how an American painter working in London helped shape Australian national identity. Highly recommended. Posted in General, Painting and tagged book, Conder, exhibition, Impressionism, Matisse, Monet, review, Roberts, Russell, Sisley, Streeton, van Gogh, Whistler. Bookmark the permalink.